We started extra early this morning, to finish our walk at Punta Moreno before the sun got too strong. We started with another visit to a mangrove forest and in addition to turtles and birds we saw lots of golden rays and eagle rays. Cool! 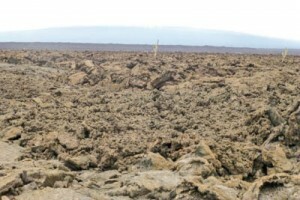 The 2,5 km walk was entirely on 500 years old lava from an eruption from the Sierra Negra volcano (25 km away). We could also see another volcano from the path. In some areas the lava had collapsed after earthquakes, and in some of these holes there were water and vegetation. In one of them we saw 4 flamingoes and in another one several sharks were swimming around. On the lava itself there were not much animal life except lava lizards, but we saw one of them catching and eating a cricket which was quite cool. Also a Galapagos hawk flew just a couple of meters above our heads. As soon as we got back to the boat, we got ready to go snorkeling. Again we saw several large sea turtles, and a few tiny sharks (possibly babies). We searched the sea weed for sea horses, but only found fish everywhere. 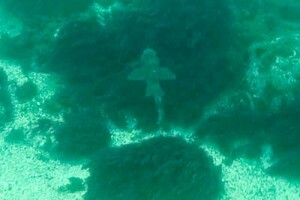 Also a single penguin was swimming around in the area. We were back at the boat at 1030, and since we had no more activities this day, we decided it was beer o’clock. We relaxed on the sun deck watching the spectacular landscape and hundreds of birds diving into the sea to catch fish. We had an early lunch before reaching the rough waters on the south side of Isabela island. After lunch most of the group took a siesta in the room, while a few stayed on the sun deck watching for wildlife in the strong wind and rough sea. At 1730 we arrived in Puerto Villamil, a small port where most of Isabela’s almost 3000 inhabitants live. It was strange to be this close to civilisation again, but we stayed on the boat the entire evening. The water was really clear, so while waiting for dinner we stayed on the sundeck watching turtles, sea lions and several Galapagos sharks swim by. 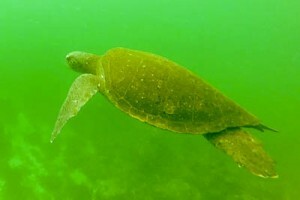 We even saw 4 male sea turtles mating with one female just a few meters from the boat. Felix, the chef, brought us some popcorn, since it was longer than normal between lunch and dinner. After dinner we showed the edited GoPro videos to the rest of the group, before going down to the swimming platform in the back. 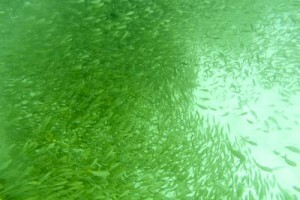 We brought torches and could see hundreds of small fish flocking around the light. Even more sharks swam by, and several sea lions were playing around, sometime so close that we could have touched them. Even though we have seen hundreds of them, we’re still fascinated. 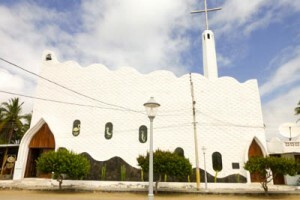 We went ashore in Puerto Villamil where a minivan was waiting for us. 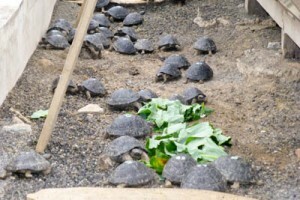 It took us to a Giant tortoise breeding center, where we arrived just in time for feeding. 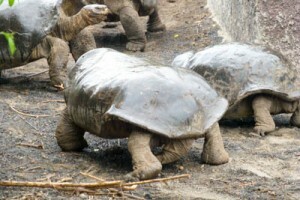 There are 10 different tortoise spieces on Isabela, but several of them are almost extinct. In the past both pirates and whalers took thousands of tortoises on board their ships. Since they can survive for a long time without water and food, they were a source of fresh meat. Additionally introduced animals like dogs, cats, donkeys and goats destroy nests, kill baby tortoises and eat the same food. Tortoises born in the breeding center are protected there until they are 8 years old, before they are released into the wild again. It was fun to see the newborn tortoises and the different spieces, but the museum was outdated. We had a short stop at a flamingo lake on our way to Sierra Negra Volcano (the second largest in the world). It was raining when we arrived, and the visibility was very bad. After walking on a muddy path for 40 minutes, we arrived at the viewpoint, where we could only see a few meters. Back in the van we ate our box lunch, and went back to the city, where we had more than 3 hours to do whatever we wanted. Some went swimming or snorkeling, and a couple rented bikes. We walked around the in the city center, did some shopping (we were almost out of sunscreen) and had a couple of beers in a local bar. At the pier there were several marine iguanas, sea lions laying on benches and anywhere in the shadow and we also saw a few eagle rays swimming by. Back at the boat a few went for a swim and jumping from the dingy, and in the evening we enjoyed another wildlife show behind the boat. 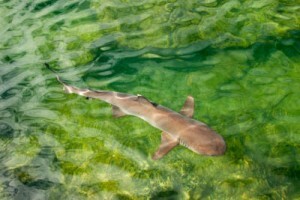 Several reef sharks, a sea turtle and three sea lions chasing and catching fish. It’s amazing how fast they can move! 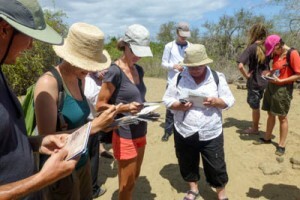 During the night we had sailed to Floreana island and our first landing was at Punta Cormorant. We started at a brown sand beach with green olivine crystals. There were several sea lions on the beach and playing in the water, and even a couple of penguins. 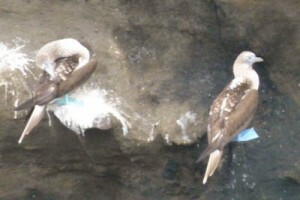 Several birds were sitting on a cliff, among them a young and fluffy blue footed boobie. 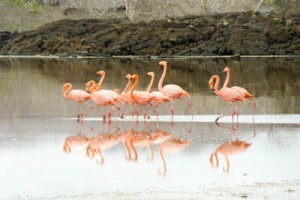 We stopped at a lagoon where several flamingos where walking around, making a lot of noise. They even walked on land so that we could really see their long legs. 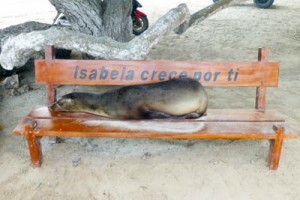 On the other side there was a beautiful white sand beach with lots of turtle nests, and a sea-lion relaxing in one of them. A few turtles were relaxing in the shallow waters, along with several stingrays looking for food. 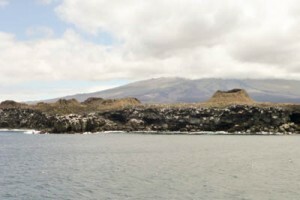 After a short stop back at the boat we were ready for the famous Devil’s Crown, the best snorkeling spot in the Galapagos according to lonely planet. It’s 3 small islets surrounded by coral reefs and millions of fish. The currents are quite strong so most of us needed a lift in the dingy (or behind it holding a rope) between the islets. The water was really clear, and there were fish in all sizes and colors wherever you looked. 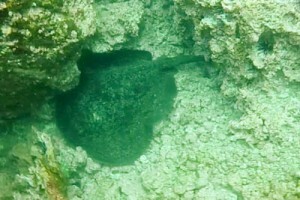 A few sea lions were playing around, and we saw a couple of gigantic stingrays in addition to a smaller eagle ray. The crew could hardly get us out of the water. Spectacular! We had one more short stop in Post Office Bay, only 20 minutes away, where whalers used to leave mail in a barrel for other boats to pick up if they were headed in the right direction. The barrel is now used by tourists, and we picked up a card to be delivered in Asker, only a kilometer from where Fredrik lives. A bit higher up the ruins of a Norwegian fish canning factory is found. 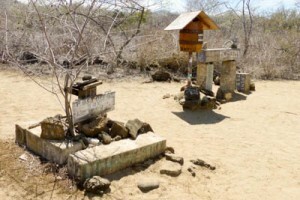 It was very successful for a short time until the dry period when there was no food or water available for the workers. After lunch we started our 4 hour journey to Puerto Ayora on Santa Cruz island. Shortly after we were joined by a group of large dolphins swimming and jumping around the boat. 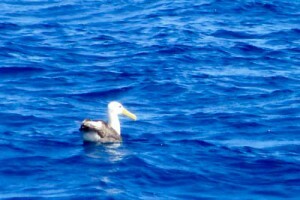 We also saw several albatrosses flying close to the boat. We arrived in Puerto Ayora at 4 pm, walked through the main street before sitting down at one of our favourite bars for a couple of drinks with a few of the other passengers. 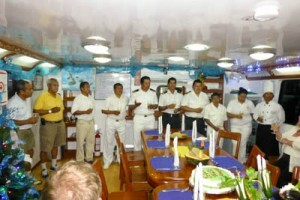 Back at the boat the crew had prepared for a farewell dinner. 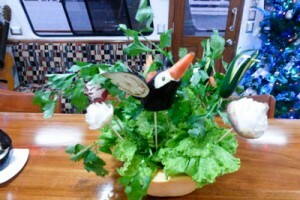 They were all dressed up, the table was decorated with vegetables formed as Galapagos animals, the owners of the boat were visiting and Wilma served farewell cocktails. We had another amazing dinner, shared contact information, took some group photos and ate way too much cake. After packing our bags we rounded off the evening with a couple of beers on the sun deck while discussing the highlights of the trip. 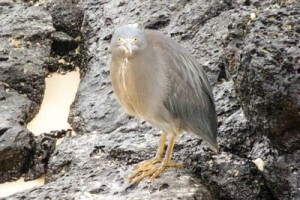 We got up at 6 am to watch the bird life while sailing around the island Daphne Mayor. 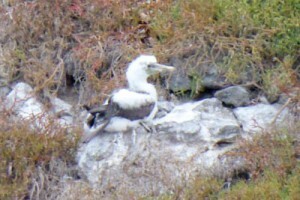 Finally everyone got pictures of blue footed boobies, and lots of Nazca boobies were also sitting on the cliffs. We went to the airport at 8 am where we said goodbye to everyone, and left for Guayaquil at 10 am. In summary, the cruise was above and beyond all our expectations. Even though we had read about the large number of animals and how close you could get to them, we were amazed every single day. We learned so much about them, from the guide of course, but also by watching them from the boat and on land. We were never hungry during the cruise. Chef Felix made 3 meals per day, often 2 or 3 courses. We had a new egg dish for breakfast every day, and whenever we got back from landings/snorkeling we were served a juice or a hot drink (also different every day) and some sort of snack (from pizza to Yucca bread with honey). The entire crews were amazing, attending our every need, but at the same time laughing and having fun. And the passengers worked really well together, looking after each other, sharing stories and knowledge, laughing a lot and having the time of our lives!